The Bet9ja app offers new Nigeria players the chance to claim the operator’s 100% welcome bonus, among others. This is a review of the Bet9ja mobile app and includes the system requirements, the available bonuses and promotions you could obtain after signing up, and the various handy features you can benefit from while on the go. The table below gives a brief overview of how the bookmaker has scored against each category. Visit the operator’s mobile app page: https://promo.Bet9ja.com/mobileapps/. Tap on “Download Casino” or “Download Sportsbook” depending on what product you want to start with. A warning pop-up will appear asking you to confirm that you want to download this particular type of application (.apk). Give permission, as the Bet9ja app is safe to download. You will then need to modify the settings of your mobile phone or tablet so that the Bet9ja app can be downloaded. Go to “Settings”, then “Application” or “Security” and tick “Unknown Sources”. Once the download of the bet9ka mobile app is completed, you can select the .apk file to initiate the installation process. As soon as the final step is finished, you can open the app and start betting (or playing, depending on which bet9j mobile app you have downloaded). Now, if you own an iOS or Windows or Blackberry portable device, you can use your phone’s browser and access the mobile platform, which will give you access to everything provided at the desktop version. To use the Bet9ja mobile app, your Android must be 4.1 or higher and have around 8MB space in your portable device to store the app. Once you have downloaded the Bet9ja app, you can claim the 100% welcome bonus up to ₦100,000. To do that, you will need to register with the operator and make your first qualifying deposit, which is easy. Simply tap on the Register button on the top of the screen (also found if you scroll all the way down), fill out the sign-up form with the required details, and then make your first deposit. Note that, sometimes, a Bet9ja promo code is available and you can use it to enhance your online sports betting experience or even claim the current bonuses and offers. The bonus is valid for new players only, who register online and make a deposit. The minimum deposit required so that you qualify for the bonus is ₦100. You need to stake the full worth of the deposit on singles or multibets on any sports market with, at least, 3.00 odds. The maximum bonus sum that can be credited to an account is ₦100,000. Wagerign requirements apply (10x the bonus amount). The Bet9ja mobile app features a wide range of the bookmaker’s services, including the handy Odds Filter that helps players narrow their results based on specific odd parameters (i.e., a particular return from a set stake). Nigeria punters also have the chance to access the app using a special platform that requires less data to run, provided they are ready to come to terms with a less eye-catching design and interface, and slower load times. That aside, live streaming is also available across different sport events, enabling bettors to bet and view all the action at the same time. The cash out option is another function that mobile users can benefit from, and make profit before the game or match ends (if you believe your bet will lose). Besides, the Bet9ja mobile app hosts virtual betting too, alongside a plethora of casino and sportsbook bonuses and promotions. No live betting, though. We have gathered the most common questions Bet9ja mobile app users ask and answer them in the section below. Choose the sport of your interests (found in the left column of the page). Click “View” and then pick the events and odds by tapping on the preferred options. You will notice that your selections instantly update the betting slip on the right. Type in the amount you wish to bet and tap “Continue”. Press “OK” and you are done! The Bet9ja app offers a plethora of funding methods to help you make a deposit. Depending on the option you choose, there are different directions as to how to make a deposit. Instant bank transfers appear to be the most convenient for Nigeria players as they can be concluded with just three taps. First, you go to “My Account” and tap “Deposit”. Then, choose the Instant Bank Transfer option that best suits your needs, and follow the instructions provided on your screen. If you wish to use another payment method available on the Bet9ja mobile app, you can visit the Tutorials section: https://web.Bet9ja.com/Pages/Tutorial_main/Guest. Cashing out is just as easy as making a deposit at the Bet9ja app. Start by logging in to your account with your personal credentials. Then, go to “My Account”, tap “Withdraw”, fill in the bank details required, and hit “Next”. If everything checks out well, tap “Confirm”. Note: It is vital that your personal registration information matches the Account Holder name. In any other case, your account will be suspended, and you will need to go through an account verification process. Getting in touch with a customer service agent from the Bet9ja mobile app can be done via an online contact form (average response time 48 hours), telephone (from 08:00 to 21:00), the operator’s Twitter customer service, or snail mail. 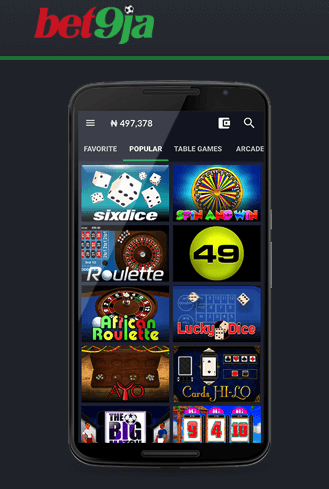 Those that wish to take the full Bet9ja sports betting experience on the go will be greatly pleased with the functionality, user-friendliness, and plethora of functions and services provided at the Bet9ja mobile app, including live streaming, cash out, and exclusive features such as the Odds Filter. Although there is not a dedicated iOS app, all users can access the fully responsive mobile site and register, claim the generous welcome bonus, access all other promos, and enjoy everything else is offered at the platform. User-friendly interface on mobile app but mobile version of the site as well. Copyright © 2019 · www.promotion-code.com.ng · Ask us anything · Play responsibly!